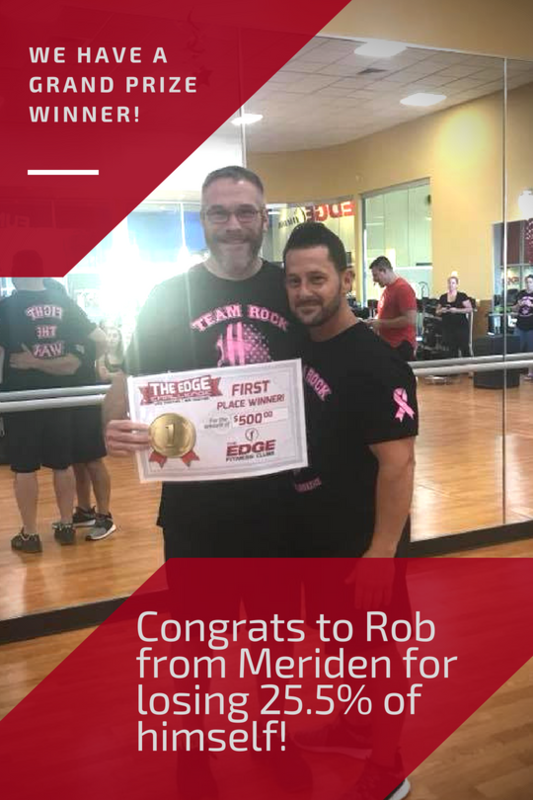 Congrats on completing your Edge Challenge Journey! You finished. Way to go! Check out the final leaderboards and company winner! Congratulations to everyone who finished this Edge Challenge! You committed to a goal and YOU saw it through. On behalf of The Edge Fitness Clubs, I would like to say THANK YOU! Thank you for trusting us to bring you to your fitness goals. Thank you for finishing. Thank you for putting your best foot forward in this Challenge. NOW, I challenge YOU to pay it forward! Help us make a difference in the lives of others. Share your experience, strength, and hope as it pertains to the Edge Challenge. There are others in your life that WILL benefit from your shared experience. We lost a whopping 9,250 lbs as a company! That is an average of 616 lbs per club and 10.2 lbs per participant! WHOOAA!! The tough part is only 53% of the people that started The Edge Challenge finished it. The road to 70% finishers or more is still being built and YOU have helped us lay some more bricks. Keep your goals alive, keep pushing forward, keep breaking through your ceiling, and keep succeeding. I promise you will be a better person in the end!! The next Edge Challenge kicks off September 17th and we hope to see you there! Cherry Hill, NJ and Delran, NJ will be kicking off for the first time! 17 clubs will be doing the next Edge Challenge! We hope to see you and someone you want to share the experience with there! Until next time, CONGRATS and SEE YOU SOON! The next Edge Challenge starts on September 17th! You received this email because you are subscribed to Announcements from The Edge Fitness Clubs Corporate Headquarters.